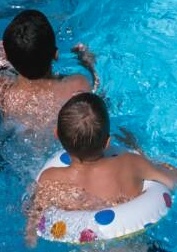 Every summer children play and swim in outside and usually, in California, there are often swimming pools nearby. Unfortunately, literally thousands of children are victims of fatal drowning accidents each year – making death by drowning the leading cause of accidental deaths for young children. Have you experienced a family loss because of a drowning accident? Or if you are suffering from non-fatal injuries caused by a near-drowning? If so, the trial lawyers at Golden Gate Law Group will evaluate your case free of charge. If the incident was caused by someone’s negligence, we will help you get the financial compensation you or your loved one is entitled to. A swimming pool accident is often severe, disabling, or fatal. Water and hard surfaces can all too often result in creating a dangerous and potentially negligent situation. Is it really surprising that most swimming pool accidents involve children playing around pools without adequate supervision? Like it or not, swimming pools present a clear danger to young children, especially when unattended. That is why California law mandates that private swimming pools be fenced and secured from unauthorized visitors and trespassers. California state law maintains that owners of swimming pools should take reasonable safety precautions when it is reasonably foreseeable that children could trespass to swim in a swimming pool and drown or otherwise cause harm-injure themselves. For instance, many local and city ordinances require swimming pool owners to install fences and locks around pools to prevent children from gaining access and possibly drowning. Apartment complex owners with pools are also held accountable if the pool area was not secured; and allowed a child to gain access to the pool area. For over 35 years, the personal injury attorneys at Golden Gate Law Group have represented swimming pool accident and drowning death cases in court. Our experience working with accident scene rescue personnel and witnesses, including expert witnesses to determine the cause of an accident, enable us to build a strong case for our clients. After thoroughly reviewing the evidence of what happened at the scene of the accident, we review all applicable California laws and regulations to determine if any laws were broken. If you were injured as a result of swimming pool accident in California you have a limited amount of time to file a claim of your injury or you could lose your right to recover damages for your losses. Contact the the swimming pool accident lawyers at Golden Gate Law Group now for a free consultation and case evaluation. Call toll free 1-800-704-0151.